Golden Perch fingerlings about to be released in to Lake Ginninderra on Friday. Photos: George Tsotsos. The ACT’s native fish stocking program is starting to net results with anglers pulling some big ones out of our lakes, and populations establishing themselves to play their role in the aquatic ecology of the Territory. 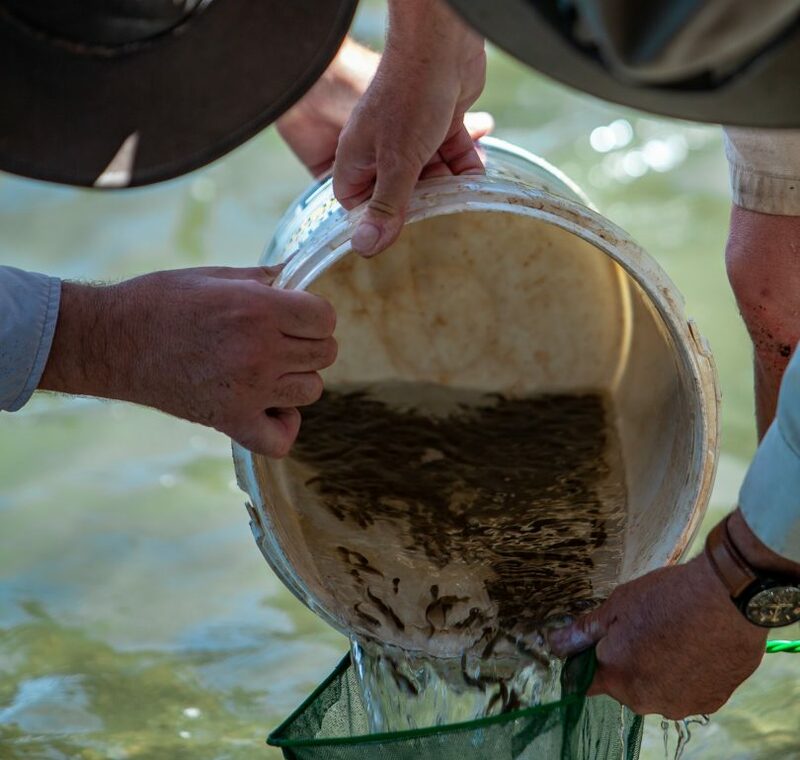 On Friday (4 January) the release began of thousands of Murray Cod and Golden Perch fingerlings, which have been found to be the species best suited to ACT conditions, into lakes and ponds as part of the joint program funded by the ACT Government and the National Capital Authority. Canberra’s lakes are set to benefit from an important native fish restocking program. 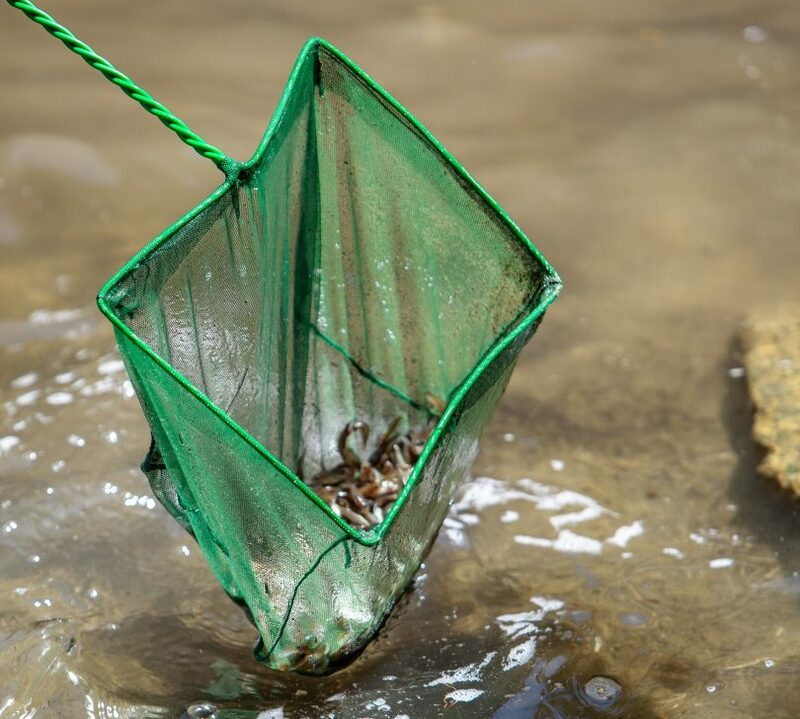 Click play to hear Mick Gentleman MLA, Peter Beutel from the National Capital Authority and Aquatic Ecologist Mark Jecabsons explain why it’s critical that fingerling stocks are restocked in our local waterways. More than 15,000 Golden Perch will be released into Lake Ginninderra, 3000 into Gungahlin Pond and Yerrabi Pond, while 5000 Murray Cod will call Lake Tuggeranong home. Murray Cod (2000) and Golden Perch (3200) will also be released in Upper Stranger Pond and Fadden Pond to establish a native fish population following carp removal in 2017. The NCA will put 27,300 Golden Perch into Lake Burley Griffin. Environment Minister Mick Gentleman was by Lake Ginninderra to launch the release, saying the program was important for the ACT’s waterways and also to provide opportunities for recreational fishers. He said the release, costing $33,000 with the NCA contributing $15,000, was a good investment and would be rolled out over the next couple of days. As the fish grow, they will compete with exotic species such as carp and Redfin, and as a native species, work for the benefit of the ecology of the lake. Manager for Lakes and Dams at the NCA Peter Beutel said the program was starting to reap rewards with the development of an outstanding urban fishery, which was even becoming a tourist attraction. “A lot of people are coming to Canberra to fish Lake Burley Griffin because our goldies are of a really good size now,” he said. But exotic species and habitat loss along the shoreline do take their toll, hence the big numbers released. The NCA is working to improve the shoreline by reducing some of the exotic weeds and tree species to create a better habitat for native fish to shelter in while they are growing up until they can look after themselves. ACT Government ecologist Mark Jekabsons said monitoring showed the fish were doing well, with cod up to a metre long being pulled out of Lake Ginninderra. Other species have been trialled but it seems that the two that do the best in the ACT’s urban water bodies are Murray Cod and Golden Perch. “They’re good recreational species and anglers in the ACT enjoy catching them but they also tend to thrive in these conditions,” he said. The fish populations are surveyed every five years, and while the Murray Cod are not doing as well as the Golden Perch, Mr Beutel believes persistence will pay off eventually.